Our team have a comprehensive range of skills and experience and most importantly a big passion for gardens and outdoor spaces. We treat each garden we create and maintain as though they are our own, giving you a service that you can rely on. Danny is a co-owner and head landscaper of Andiamo Landscaping. 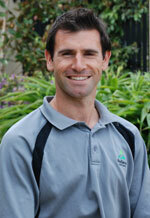 Danny is a qualified landscaper and has over 9 years experience in landscaping and the construction industry. His skills and experience make sure all construction is consistently completed with precision and accuracy. Together with his highly skilled team they have created many designer landscapes, so you can rest assured that your landscape will be constructed exactly as planned. Danny is also a keen soccer player and when he’s not working Saturdays he can be found playing for the local soccer club. 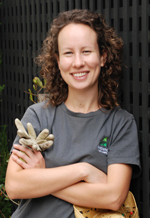 Kate is a co-owner of Andiamo Landscaping, she specialises in all aspects of gardening and plant care. She is a qualified herbalist with a passion for plants and soil, she ensures your garden is prepared to achieve optimal growth. Kate’s background also includes project management and administration, so she ensures all projects run smoothly. On her weekends Kate enjoys cooking and can often be found preparing her garden fresh vegies for family and friends. Zvonko is a landscape labourer. He has over 25 years experience in the construction industry and specialises in all areas of drainage and concreting. Zvonko is committed to ensuring the job is prepared properly, because for a precise finish you need thorough planning and preparation. Troy is midway into is apprenticeship as a landscaper. He is a team player and with his continued top quality workmanship is sure to become a highly skilled landscaper. Antz is our newest addition and has made a promising start as a first year apprentice. With a good eye for detail Antz is quickly learning that this is an essential skill to landscaping. Margaret is the team leader for the garden maintenance service. She has many years experience at maintaining and caring for gardens, she will give your garden the special touch to ensure it stays healthy and tidy.